How you classify your merchandise is very important, if you are to derive maximum benefit from XpertMart™. Setting up a clear classification system will allow you to exploit all of the information stored in the database using reports and thereby improve your business' profitability. 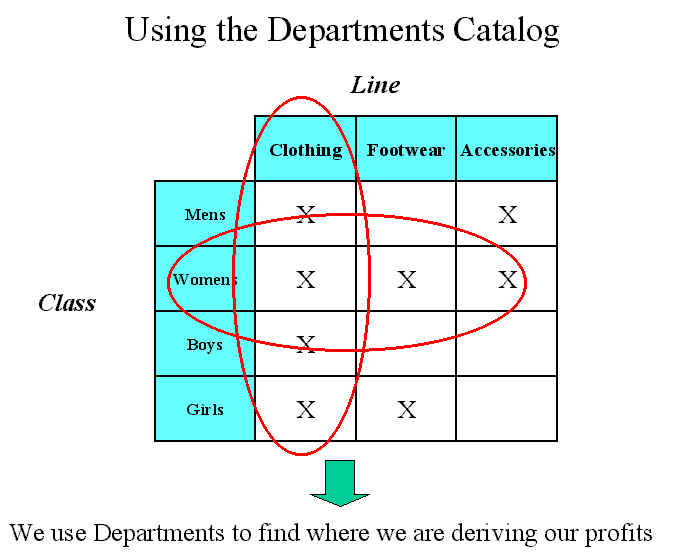 The heart of a classification scheme are the Departments, which group the Styles in your inventory. Since a poor classification system will constrain your analytical ability in the future, it is worth taking extra time to set up a good classification system. Creating the Departments you will use is not something you should rush into. Spend the necessary time brainstorming possible department combinations and be sure to test your classification scheme with a representative sample of your current inventory before settling on a final version. It is not unusual for a retailer go through this process 3 or 4 times before coming up with the best set of departments. A good classification scheme is one that allows you to view your data from any desired angle. Being unable to run report on a segment of your inventory might indicate a poorly conceived classification system. A poor classification often forces you to piece together a variety of reports manually or export your data to Excel in order to derive the analysis you are looking for. A typical shoe or clothing store carries anywhere from 800 to 1,500 styles. If each Style has an average of 3 colors and 6 sizes, then a typical store is carrying between 14,000 and 25,000 unique Items. Since it is nearly impossible to analyze the performance of each of these Items or even Styles in a timely manner, retailers group their styles into departments to help them better make decisions. When you set out to create the Departments you will use, your goal should be to settle on 30 to 40 Departments that will cover your entire inventory. If you try to use more than 40 departments, then you are back to the original problem of having too many units of analysis. A good rule of thumb is for each Department to represent at least 3 or 5 per cent of your total sales, otherwise they are not worth spending a lot of time analyzing. On the other hand, if you have too few departments, you run the risk of missing important sales trends you could detect and capitalize on. If a single department is covering more than 10 to 12 per cent of your sales, it is probably covering too broad a segment of your merchandise. Within that 10% half of the merchandise could be experiencing strong sales growth (and therefore merit greater investment) but could be lost when average with the other half, which is not growing. Each Department could be thought of as its' own business unit. You should treat your 30 to 40 Departments much like a professional investor treats his portfolio of stocks, always looking for the best return on investment. Your Department scheme should give you a good map of where money is entering or exiting your business. You should always be ready to answer a question like: would it be better to invest $1,000 dollars in the Women's Clothing Casual Pants Department or in the Men's Footwear Dress Loafers Department? The proper analysis of Department profitability can have profound effects on a retailer's business. One of the most extreme cases we have encountered was an XpertMart™ customer who owns a chain of 20 stores. Originally the stores sold clothing and shoes for Men, Women and Children. However, after a careful analysis, this retailer realized that the vast majority of his profits (as opposed to revenue) were coming from a handful of Departments, primarily Children's Footwear. This retailer took the dramatic step of closing his stores and reopening them as a chain of Boys & Girls Footwear stores. He has enjoyed healthier profits ever since then. A Department is made up of up to four levels of classification: a Line, a Class, a Subclass and a Type. The four levels typically flow from the most general (Lines) to the more specific (Types). Every classification level is derived from the previous one. Each Department is defined by a unique combination of these four levels of classification. Lines: The first level of classification and usually the most general. For shoes and clothing retailers, the Lines will usually be Clothing, Footwear and Accessories. Classes: The second level of classification and focuses categories within each Line. Ideally each Class will apply to every Line, though this is not always possible. 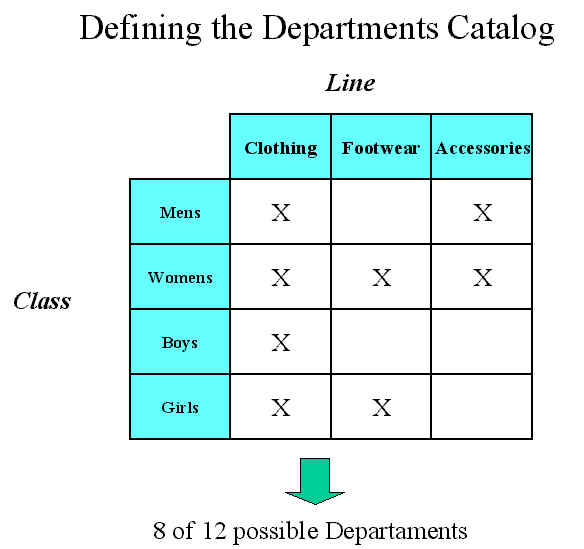 Most common Classes for retailers are: Men's, Women's, Boys and Girls. Subclasses: Allow for a possible sub categories within each Class, such as: Dress, Casual or Sporting. Types: This fourth level is optional since you run the risk of using an unnecessary amount of detail that is of little use. However, there are cases that can be quite useful, such as: Import or Domestic. Other retailers might prefer to group their merchandise into even more specific groups and use Types such as: Moccasins, Boots, Sandals and Sneakers. The first step in Creating Departments is to define the Lines, Classes, Subclasses and Types you will be using. You do not necessarily need to use all four levels, but using at least two is recommended.You need to make sure that every one of these classification levels is logically consistent. If your Lines are defined by the USER of the merchandise (Men's, Women's, etc.) it would be incorrect to mix these with the OCCASION for using the merchandise (Evening, Sporting, Casual). Each of these is logically different and merits its own classification level. Mixing two categories with different internal logics in the same classification level will make it impossible to run certain reports or queries down the road. For example, if you use Women's, Men's and Accessories as your Lines, you will not be able to break out your sales by Women's Accessories vs. Men's Accessories. Once you have determined how you will use the classification levels, you are ready to combine them to make Departments. You do not need to use every possible combination of Lines, Classes, Subclasses and Types. If you do, you will probably end up with far more Departments than the ideal 30-40. In the example above, there are 3 Lines, 3 Classes, 3 Subclasses and 2 Types, yieldiing 54 possible Departments. However, not every combination will make sense. For example, it could be that this store only carries Accessories for Men and Women, but not for Children so it would not make sense to create an Accessories Children's Department. Similarly, if only the Women's Line includes Imported merchandise, it would not make sense to create both the Accessories Men's Formal Imported and Accessoreis Men's Formal Domestic Departments. 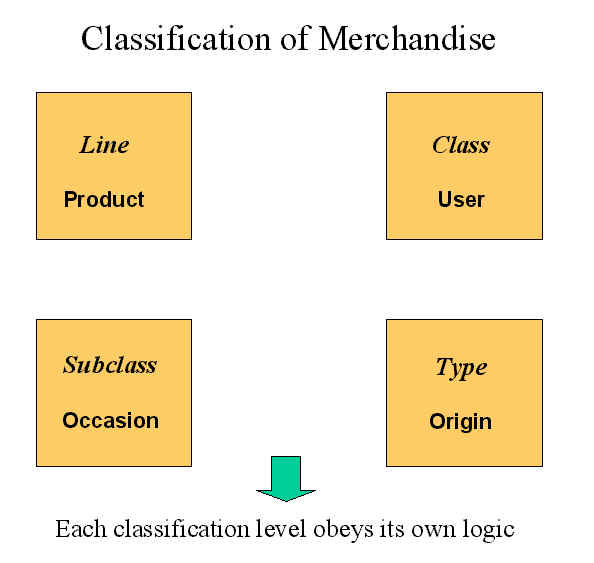 As this case shows, not all Departments need to have the same number of classification levels; some can go as far as Type (4 levels) while it only makes sense for others to go as far as Subclass (3 levels) or even Class (2 levels). Your Departments should cover all of the inventory you have without excluding merchandise or creating unwieldly Departments. 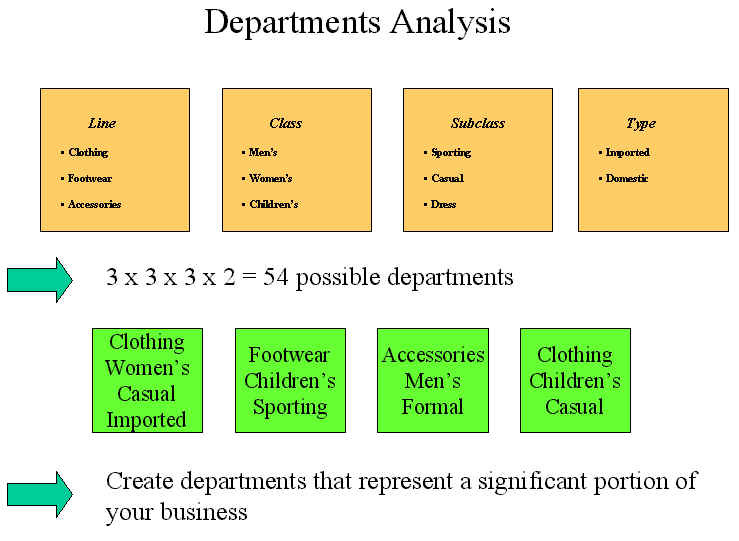 A well-designed Department structure will give you the power to better understand your business and let you run reports comparing, for example, the profitability of the Clothing Line with that of the Women's Class. Before you enter the Departments Catalog, you should first enter the Lines, Classes, Subclasses and Types catalogs individually and fill them in (see the Catalog topic for more information on the structure of catalogs). For example, if you are going to use Clothing, Footwear and Accessories as your Lines, you need to create three records in the your Lines Catalog for each of these as shown below. If you plan on using XpertMart™'s web store software you should enter a photo using the XpertImage™ tool every time you add a record to any one of these catalogs. Customers who visit your web store and begin to browse your mechandise by Lines, Classes, Subclasses, Types and Departments will see the photo you input into the catalog. When you are done populating the Lines, Classes, Subclasses and Types catalogs you are ready to enter the Departments Catalog. Be sure to press the New Record Button before you begin creating Departments. To create a new Department you can click on the drop-down menus for each of the four classification levels and select the combination you want. 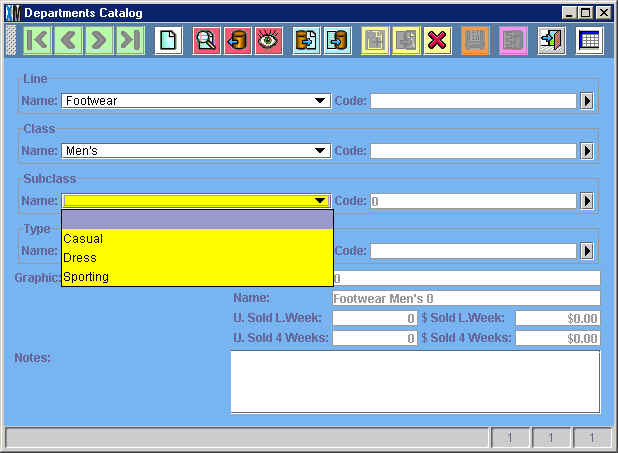 In the example below, the user is creating a new Department and so far has selected Footwear as the Line and Men's as the Class. Notice that XpertMart™ automatically creates the name of the new Department as you select the Line, Class, Subclass and Type. You can use the Copy Button to speed up the entry of your Departments. If for example you are creating the Footwear Men's Casual Boots and Footwear Men's Casual Sandals departments, you could simply copy the first one and change the Type from Boots to Sandals to create the second one. IMPORTANT NOTE: You must be very careful and make sure you do not create duplicate Departments. At this moment, XpertMart™ will allow you to create two identical Departments, so it is important for you to map out the Departments you want to be using before you enter the Departments Catalog. IMPORTANT NOTE: If you modify a Line, Class, Subclass or Type once you have started creating Departments in the Departments Catalog the view you see in the drop-down menus will not refresh. For example, if halfway through creating Departments you decide to change on of your Subclasses from "Dress" to "Formal", you will still see the words "Dress" in the drop-down menus. It is for this reason that defining the four classification levels before you enter the Departments Catalog is highly recommended.